Wow, it’s been a very busy Autumn so far. I’ve worked with a lot of expectant couples and I’ve got to the stage where I’m waiting for news of a lot of births. I’m useless at forgetting their due dates, even though I advise my couples not to focus on the date themselves. I have availability on just one HypnoBirthing course until the end of the year. It’s going to be 10am to 3pm in South Croydon / Sanderstead on 7th and 14th November. It’s short notice so let me know as soon as possible if you want to book a place. The beady-eyed amongst you will have noticed that there is £50 off the usual fee, so it’s just £225 for the 10 hour course. You’ll also receive the UK HypnoBirthing book, CD, file of information to help you prepare for the birth and obviously any email/telephone support you need before the book. Send me an email at helen_redfern@hotmail.com if you want to book one of the last places. I love that Kensington Palace weren’t exactly honest with us. We were told that she went to hospital in ‘early labour ‘at 6am when I’m guessing that, given that she had her Baby Girl at 8.34am, the birth process was some hours in. Good for them for keeping a bit of it to themselves. The Duchess of Cambridge was admitted to hospital this morning in the early stages of labour. After my initial sense of excitement – obviously I love it when I hear that someone is about to have a baby – I felt rather sorry for her for having the pressure on her that she has. There have been reports that Catherine used HypnoBirthing during the birth of Prince George. She’d have been advised to keep things as normal as possible and to stay at home during the early stages, perhaps distracting herself with normal life. However, for Catherine, the best thing to do was to go in at 6am. A lot of parents do this to avoid traffic but I imagine Catherine wanted to avoid the Press. I wouldn’t want to be almost fully dilated, sat in a car with a cameraman recording it for prosperity. The BBC tells us that that with her in her room are a consultant obstetrician and a surgeon-gynaecologist. Can you imagine having 2 male doctors in the room gawping at you in the early stages of labour? I can’t imagine that this would be conducive to letting one’s body open up but then I also can’t really imagine that there are 2 doctors in the room with her at this point. I’m sure that they are in the hospital with no other patients to look after today but I don’t think they are actually observing events – well I hope not anyway. I’d actually expect that Catherine’s main caregiver is a female midwife who isn’t being named. I was speaking to an expectant couple last week and they said that they wouldn’t tell their family that the birth had started as they would be bombarded with calls and texts asking for an update. Poor Catherine, she has hundreds of people waiting outside wanting to know how far things have progressed. Just a little pressure for her there then! So, I wish Catherine and William an easy calm birth with as little pressure as possible. They are so fortunate to be meeting their brand new baby in the next day or so. How exciting for them – and what a welcome relief from the General Election for the rest of us! During HypnoBirthing Sessions we discuss what happens once your baby is born. One of the first things that happens is that your midwife will give your baby an APGAR score. The APGAR Test was designed by Virginia Apgar, an American anaesthesiologist, to quickly evaluate a newborn’s physical condition and to determine whether any extra medical help is required. Conveniently for midwifery students, the word Apgar makes a handy mnemonic detailing the signs to be assessed: Appearance, Pulse, Grimace, Activity, and Respiration. The Apgar Score is usually assessed twice: once at 1 minute after birth, and again at 5 minutes after birth. Sometimes, if there are concerns about the baby’s condition or the score at 5 minutes is low, the test may be scored for a third time at 10 minutes after birth. You midwife will give each of these signs a score from 0 to 2 and total them up to give your baby a score out of 10, with 10 being the best score. Most mums who have had an easy calm birth and who have a clearly healthy newborn baby will want to have immediate skin to skin contact; it can be a good idea to mention on your birth preferences that you would like the APGAR score to be assessed whilst your baby remains on your chest, rather than being whisked away to a table that you can’t necessarily see. 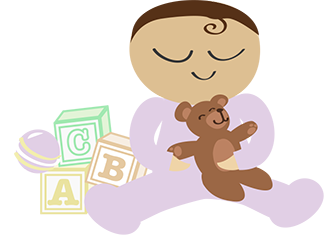 Of course instinctively, everyone is assessing whether your baby is a ‘clearly healthy newborn baby’ by looking at the signs that make up the APGAR score. Here’s hoping your baby gets a high score in the first test of their lives! Last week I told you that the wonderful ladies at Beanies* in Croydon had asked me to host their Sleep Expert Hour on Friday 2nd May. Well I can report back that I had a ball. We had a lovely group of mums of under 1’s who asked me a range of questions about Baby Sleep and how there could be more of it at there house! We had a diverse range of mums, babies and situations and I think the mums learned a lot from each other too. The upshot is that we are going to do it all again this coming Friday, 9th May at 11am. Do come along if you want to know more about Baby Sleep. We also have a 3 hour BabyCalm Sleep Workshop scheduled for Friday 16th which I’m already taking bookings for so if you are interested in this, do let me know as soon as possible. *Beanies’ address is: 3-7 Middle Road, Croydon, CR0 1RE. The wonderful ladies at Beanies* in Croydon have asked me to host their Sleep Expert Hour this Friday, May 2nd. Do come along for a coffee and chat. This will be your chance to ask whatever you want to ask about baby sleep. The FREE Sleep Expert Hour is from 11am to 12 noon this Friday. Do come along and bombard me with questions. Let me know if you’re coming!